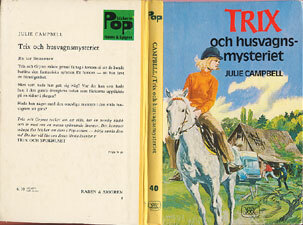 There were six books published in Swedish by Rabén and Sjögren in the early 1970s. 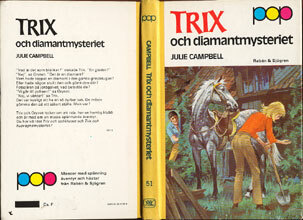 Trixie was renamed "Trix" and that became the title of the books. In the Swedish books, the Belden family is called the Bolling Family. Brian becomes Bert, Mart is known as Martin and Honey is called Grynet Viman and Jim is Jonas Walfrid Fredriksen, but calls himself Jim. Also, Regan is called Rex and Miss Trask is known as Miss Trast. Di is referred to as both Di and Diana. The titles are listed below. Click on those with hyperlinks to view the covers and information about the books. 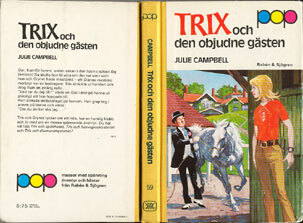 Cover illustrator also illustrated the first two books in the original Norwegian editions. 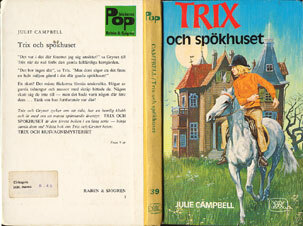 End pages list the first two titles as well as books by other authors, including Enid Blyton. End pages list the first four titles as well as books by other authors, including Enid Blyton.